Woody Herman CDs @ Hep Records, jazz in depth from the 1930's to the present day. Woody Herman was born May 16, 1913 in Milwaulkee, Wisconsin. As an exceptional musical talent in his childhood he soon gravitated to performing in vaudeville and clubs by the age of 12. He became an accomplished singer, dancer and proficient on saxophone and clarinet which enabled him to get work with various dance bands in the late 20s and into the 30s. By 1935 he was a featured singer and soloist with Isham Jones, a leading band of the times and made his first recordings. When Jones decided to retire in 1936 the bandsmen elected Herman as their leader as he had all the attributes deemed appropriate for a front man - he sang, danced and like Benny Goodman he was a clarinettist. The band had a Decca Recording contract and for the next four years made a series of good dance numbers and acquired the name "The Band that Plays the Blues". In 1939 the band recorded "Woodchoppers Ball" which became a national hit and also one of the band's radio themes along with "Blue Flame". With the entry into the world war many of the experienced players were drafted for military service to be replaced by young players or those who were unfit for military duty, and by 1943 the orchestra had begun to have a different sound. The band went through an Ellington period with arrangements by Dave Matthews and even Dizzy Gillespie and the following year the beginnings of real modernity occurred. Herman was always open to suggestions from his bandsmen regarding who to hire and in particular the ebullient Chubby Jackson, bassist, began to get the leader to hire such as Pete Candoli, Flip Philips, Bill Harris and vocalist Frances Wayne. Ironically one of the most important additions to the band was made against Chubby's wishes who regarded Dave Tough as not modern enough but the leader insisted. One of the young trumpeters Neal Hefti was also a forward thinking arranger and with titles like Apple Honey, Caldonia, North West Passage, Blowin' up a Storm the orchestra went on to win all the jazz polls and become the biggest record selling band of 1945. The characteristic of the orchestra was of overwhelming brass driven by a great rhythm section, and expressed sheer power and joyful enthusiasm possibly never before or since has the like been heard. 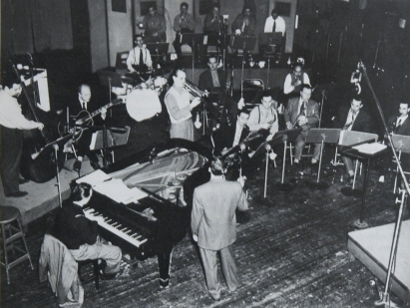 The following year with arrivals Ralph Burns, Shorty Rogers and Don Lamond the orchestra hit new heights including the concert at Carnegie Hall. Further honour came by way of composer Igor Stravinsky, greatly impressed by the brass section, who wrote "Ebony Concerto" for the band which also had a Carnegie Hall premiere on March 24, 1946. But this was about the high water mark for post war bigbands as tastes were changing. After grossing many hundreds of thousands of dollars the leader disbanded in December 1946. The quality of this edition is heard to best advantage on the V Disc Collection Hep CD 3435 and the MGM "Carnegie Hall" CD. Herman reorganised late in 1947 with what became known as the Four Brothers band with its saxophone section tonality dominated by three tenors and a baritone. The main voices were Stan Getz, Zoot Sims, Herb Steward with Serge Chaloff on baritone. The voicing originally conceived by composer arranger Gene Roland was defined by the band on one instrumental composed and arranged by Jimmy Giuffre "Four Brothers". Composer/arranger Ralph Burns was also responsible for one other great recording from this edition - "Early Autumn" - which more than any other performance helped Stan Getz break through to the front rank of tenor sax soloists of that era. The band was hugely popular with jazz fans but because of its move towards bop and concert style performances it began to lose favour with the majority of dancing America, and after losing considerable sums at the box office was disbanded late in 1949. Like the 1945 edition or First Herd, this edition called the Second Herd remain two of the truly innovative and mould breaking jazz orchestras of the 20th century. The leader continued to form and reform many editions throughout the 50s, 60s and into the 70s with excellent bands all bristling with young exciting talents but never quite recapturing the fire or sadly the popularity of the earlier editions. Woody's clarinet style never attempted the virtuosity of Goodman, Shaw or De Franco but never seemed to get in the way of the proceedings. Due to a misplaced trust in his manager Woody became embroiled in a terrible battle with the US Tax Authorities and was forced to continue working long after he should have been enjoying a retirement. He died on October 29, 1987. Woody Herman - "Early Autumn"
Woody Herman - "Apple Honey"